A chassis (plural: "chassis") consists of a framework which supports an inanimate object, analogous to an animal's skeleton; for example in the construction of an automobile or of a firearm. In the case of an automobile, the term chassis can refer to the frame and to the "running gear" like engine, transmission, driveshaft, differential, and suspension. In an airplane the chassis consists only of the landing gear or undercarriage, not the airframe itself. An AMX 30 AuF1 chassis under repair. A tank's chassis (hull) comprises the bottom part of the tank, which includes the tracks, power plant, driver's seat and crew compartment. In most general usages when one says "tank chassis" one means the tank without the turret. 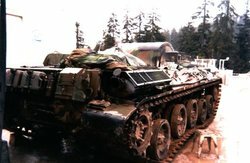 Tank chassis often serve as basis for tank-converted platforms such as armored personnel carriers, combat engineering vehicles, etc. A chassis in a television, radio, or other electronic device consists of the metal frame on which the circuit boards and other electronic components are mounted. In the absence of a metal frame the chassis refers to the circuit boards and components themselves, not the physical structure. In computers, the chassis refers to the rigid framework onto which the assembly-worker mounts the motherboard, memory, disk drives and other equipment. It also supports the shell-like case: the housing that protects all of the vital internal equipment from dust, moisture, and tampering. The term "case modding" refers to the artistic styling of otherwise rather functional and plain computer encasings. Main article : computer case.